The United States qualified for the knock-out rounds by defeating a French side that were the better team for most of the game. Even so, it was an impressive win that underlines why the US are gold medal favorites. France remain their most likely competitors for that honor, but will probably face either Canada or Germany (disappointing but still dangerous) in the quarterfinals. Manager Philippe Bergeroo replaced Eugénie Le Sommer with Marie-Laure Delie at the top of France’s 4-3-3, while Jill Ellis made two substitutions for the United States in their 4-4-2, both for injuries. Crystal Dunn replaced Mallory Pugh at right wing, while Whitney Engin replaced Julie Johnston at right center-back. France were clearly the better team in the first half, where they controlled the flow of the game and consistently attacked down the left flank, targeting Engin and Kelley O’Hara. Then there was Wendie Renard, clearly the best player for either team in both attack and defense. Allie Long was simply unable to mark her on set pieces, time and time again. It was Hope Solo more than the defense as a whole that kept the United States in the game. She had fantastic saves against a Renard header at 16′, and again in snuffing out a 41′ Delie chance after the striker had held off Meghan Klingenberg, creating an open path to goal inside the box. Even so, the US did have limited chances in the first half, most notably a Tobin Heath free kick, earned by Carli Lloyd, that Sarah Bouhaddi had to tip over the crossbar. The United States came out much more aggressively to start the second half, disrupting France’s control of the game for a solid twenty minutes. At 56′, they had an impressive counterattack that ended with Morgan Brian unable to beat Bouhaddi to a ball from Heath, a 50-50 chance that might have gone differently had Alex Morgan been the one in position to receive it. The goal came at 63′, when Brian fed Heath into the left side of the box. Her near post shot looked very similar to Morgan’s goal in the New Zealand game, but it came off the post–to a poaching Lloyd for yet another game-winning goal. Both the US and France reacted fairly quickly following the goal. Ellis brought on Ali Krieger at right back, pushing O’Hara up to right wing. Bergeroo, for his part, replaced a fading Louisa Cadamuro (née Necib) with Élodie Thomis. Thomis was an absolute terror for the US down the right flank (Kadidiatou Diani moving to the left), creating chances for Delie (via Jessica Houara) at 77′, and for Renard at 79′. Solo was again the star for the US in the final twenty minutes. 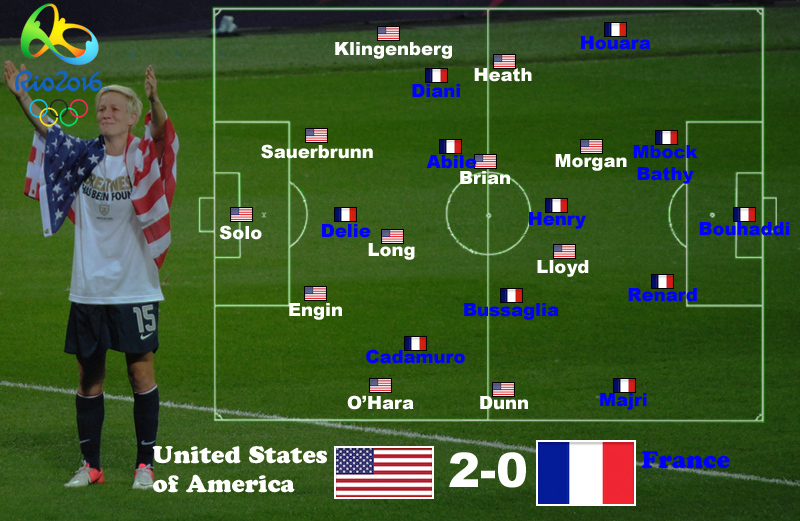 If the United States were the second best team for the majority of the game, they were always close to France. Assessing why they were able to take the initiative for the opening twenty minutes of the second half is tricky. One explanation would be a higher pressing line that undermined France’s possession and allowed the US to establish their own attack. But in post-match interviews, Lloyd insisted that there was no tactical change involved. If true, that’s a bit worrisome. It would mean that the US did a very poor job of implementing their plan for the opening 45′, and that Ellis’s only response was to request more of the same–but better. To criticize the United States or Ellis at this point, however, is probably to seek the dark lining in a silver cloud. With qualification wrapped up, expect significant rotation for the final game against an underwhelming Colombia side. I expect Lindsey Horan and Ali Krieger to start for Carli Lloyd and Kelley O’Hara, with Whitney Engin retaining her place. Hopefully, Christen Press will also start, either for Crystal Dunn or Alex Morgan; and if fit, Megan Rapinoe should get her Abby Wambach moment in place of Tobin Heath. If you’re looking for more exciting alternatives this afternoon, consider Germany – Canada, which will determine the Group F winner; and France – New Zealand, for second in Group G. The winner of these two games will meet for what should be the best match-up in the quarterfinal draw.